At my house we eat a lot of chicken and I am constantly creating new recipes to keep our love alive for this protein. My new Greek Chicken on a Stick will make you fall in love with chicken all over again. It is tender, moist and juicy and is infused with all the perfect Greek seasonings and flavors. The best part about this dish is that it is Whole30, Keto, and Paleo compliant. One of my favorite olive oil brands to use is Pompeian. I use their smooth blend for sautéing veggies and proteins and I use their robust blend for all of my dressings and marinades. The main key to juicy and tender chicken is marinating it overnight. My Greek marinade is filled with amazing flavors that brings to life a boring piece of chicken. I use a mixture of olive oil, oregano, parsley, basil, and garlic cloves and add this to my chicken tenders and refrigerate overnight. I love adding these skewers over a fresh plate of arugula served with some seasoned olives and drizzled with fresh lemon juice along with a little of the Greek olive oil dressing. Not only does this serve as an amazing weeknight or weekend meal, but it also is a great dish to prep on Sunday for lunched during the week. I will make a big batch of Greek chicken skewers and prep a big pan of roasted veggies on Sunday and use that for easy grab and go meal throughout the week. My Greek olive oil dressing can be used in many different ways that will bring amazing flavor to veggies, proteins and salads. It reminds me of the olive oil blend that was served with bread at Macaroni Grill. As a child, this was one of my favorite restaurants to go to and as I waited for my food to come, I would wait patienyl and dip my bread in the olive oil blend. It was seriously the best stuff in the entire world. If you are bored with your plain chicken breast, give this recipe a try. It will serve as an easy weeknight meal or a romantic dinner with your significant other. 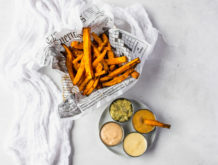 If you are living the healthy lifestyle and are completing a Whole30 or living the Paleo and Keto lifestyle, this meal will absolutely hit the spot and leave you feeling full and satisfied. 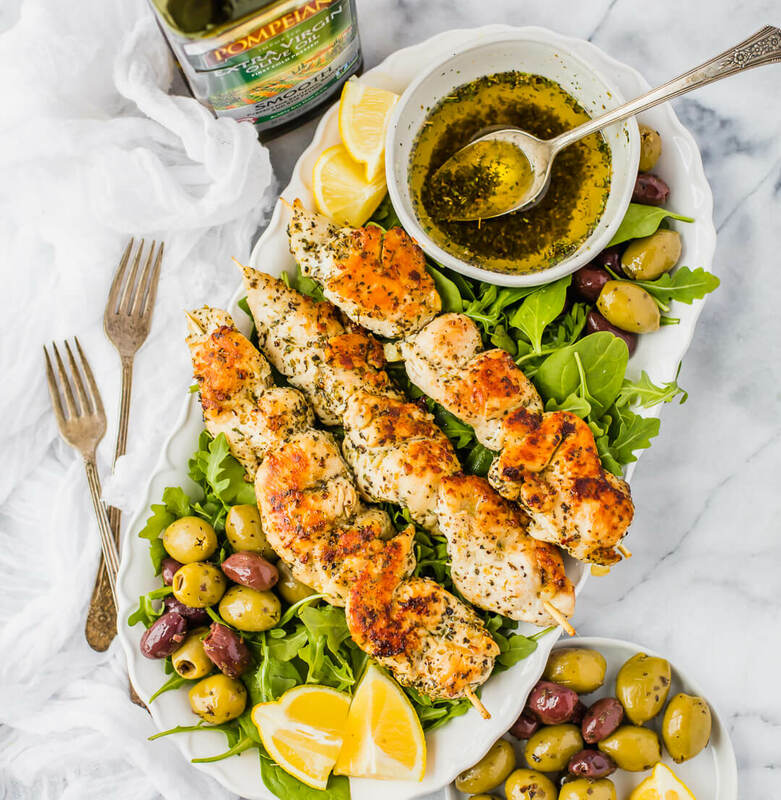 A juicy and tender Greek chicken on a stick drizzled with a Greek olive oil blend with lemon juice. This dish is Keto, Paleo and Whole30. Remove chicken from the marinade and add 2 chicken tenders to each skewer stick. Heat a medium skillet over medium-high heat and add 2 tbsp of olive oil and add in each skewer. Allow to cook for 6 minutes on each side or until juice runs clear. Remove the chicken skewers and add on top of a bed of fresh arugula and serve with olives and drizzle with lemon juice and a little Greek olive oil dressing. Add all of the ingredients to a bowl and mix together with a spoon until combined.